For many years the village was separated for ecclesiastical purposes into the parishes of East and West Allington. The parishes were united in 1896 and the Church of St James in East Allington was demolished. The grave-yard is still visible and a cross now stands where the altar once stood. The surviving Holy Trinity Church that dates from the 12th century continues to serve the whole community. YOU WILL NOT FIND A WAR MEMORIAL IN ALLINGTON. IT IS ONE OF THE 14 VILLAGES IN THE UK THAT IS DOUBLY THANKFUL. EVERY SINGLE ONE OF THE 32 RESIDENTS THAT SERVED DURING BOTH WARS CAME HOME. AN INCREDIBLE FEAT. During the Second World War many persons were exempt from service because, as farm labourers, their work was vital to the home effort. The war years saw Welby Hall becoming a military hospital and a POW Camp was established in the village which held Germans and later Italian prisoners. 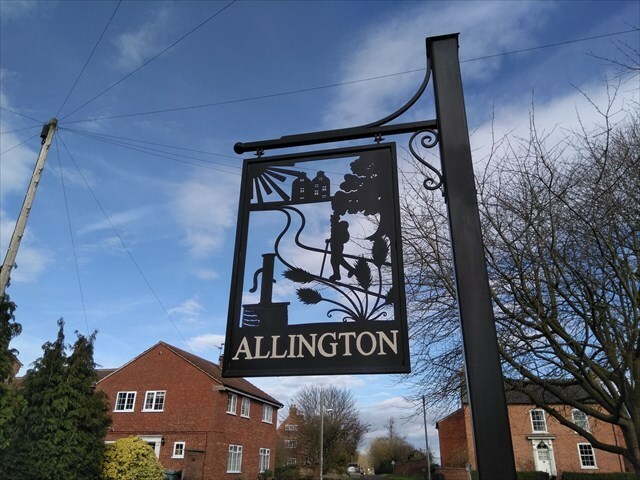 Allington has a long agricultural history and for many years farming was the pre-eminent occupation in the village. At the time of the 1851 census, 75% of villagers worked on the land or as domestic servants. At this time the village had some 25 persons with a trade or skill other than farming. This number had risen to over 30 by 1881. The Parish Register of 1863 shows a shop-keeper and there are references to a shop as early as 1746. A post office was established on the village green in 1863 and there were originally two pubs, The Plough, now a private residence known as the White House and The Spread Eagle now known by a different pub name, which is not allowed to be named here.